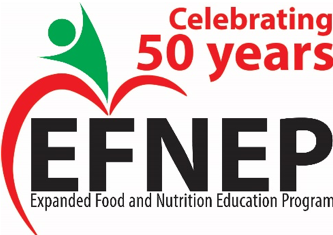 In 2019, EFNEP will be celebrating its 50th anniversary! How do you recognize and celebrate the endurance of a program that has its roots in the start of the war on Poverty? As it turns out, lots of different ways that include a new logo, a new infographic, invited recipes from educators across the country and an extensive social media plan. At the last EFNEP National Coordinators conference in D.C., I was part of a small workgroup that brainstormed ways for each land-grant university to celebrate EFNEP. We came up with multiple ideas that could be coordinated across the country, but may vary depending on region, territory and audience served. Celebratory events will start in January and you can find more about our preparations here. So what has endured over the last 50 years? EFNEP has made a difference in the lives of families across the United States since 1969 when Congress authorized $30 million to fund the partnership between USDA/NIFA and 1862 and 1890 land grant institutions to address the nutrition security of low-income families. Today, 76 institutions provide the program nationwide through Extension in all 50 states, U.S. territories, and the District of Columbia. EFNEP has a delivery model that stood the test of time. Peer educators deliver group and individual nutrition education on topics of food safety, food preparation, food resource management and nutrition. Longitudinal studies have shown that improved health-promoting behaviors are maintained, and that new skills learned through EFNEP can last a lifetime – and across generations. Each land grant university delivering EFNEP is able to set priorities to meet the needs of their communities. MN EFNEP is geographically located in the four most populous counties in the state including Hennepin, Ramsey, Anoka and Dakota. In response to shifting demographics, we hire educators indigenous to the communities we serve. We provide training and personal development for our educators so they gain skills and confidence transferable to other aspects of their lives. At the end of the day, EFNEP is an Extension program. It takes talents, resources and care from all corners of Extension to make EFNEP successful in making a difference in the lives of Minnesota families. So celebrating EFNEP’s 50 years is for all of us. Let’s get ready to party in 2019!